Surfing is a pretty cool sport. Has been since the sixties. Really, how can you get any cooler than riding the waves while balancing on a simple board? Well, you could gain the powers of the elements and become a super surfing pirate, taking cool to another level. Zak Storm used to be a simple surfer until he stole his father's necklace before a competition. Then he was sucked into the Bermuda Triangle and obtained the talking sword that would be his mentor and connection to the powers of the elements. And that's how he became the coolest guy who ever surfed the high seas! If your child is a fan of the Zak Storm series he doesn't have to learn to surf or fight pirates to become the nautical legend. All he has to do is throw on this costume! Your child will be ready for anything with the Calabrass sword in hand! It won't give him life advice or give him power over the weather but it will connect him with a confident attitude! 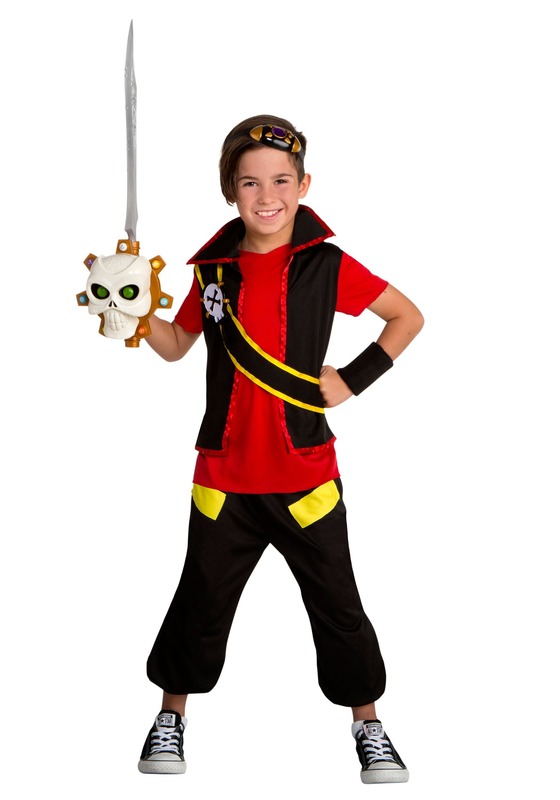 Your kiddo will be ready for the high seas with cropped pants that are great for climbing the main mast to the crow's nest, a vest and bandolier combination with skull detail, and the eye patch that Zak uses for a telescope. Who know's what the seas might have in store? Zak and his sword can handle it all! While this costume will be a fun twist on the classic pirate costume for Halloween, you might find that your child uses his Zak Storm costume for play time adventures. The Calabrass sword will take on pirates with the power of ice and fire. He'll overcome sea monsters and whether any storm until he finds a way home in time for dinner. Now, that's a high seas adventure you can get behind!